Died: January 3, 1917, Philadelphia, PA, age 55,---d. at home in Germantown of pneumonia, after 4 days. 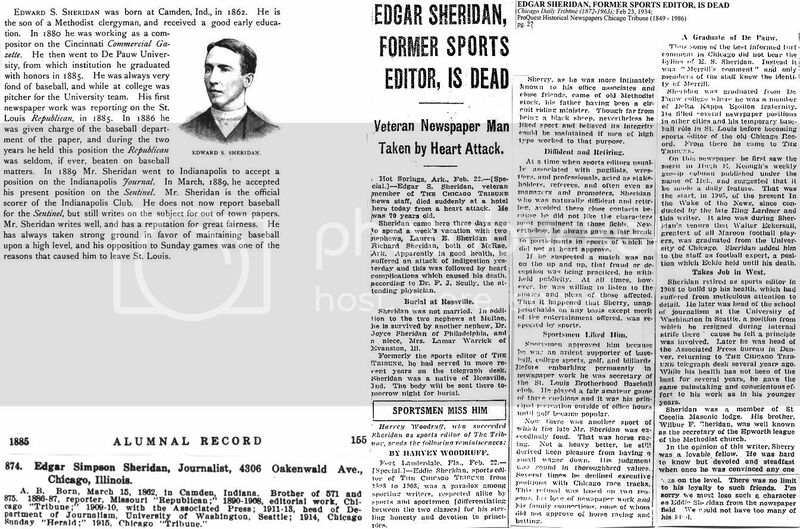 Sporting Life obituary, January 13, 1917, pp. 3. 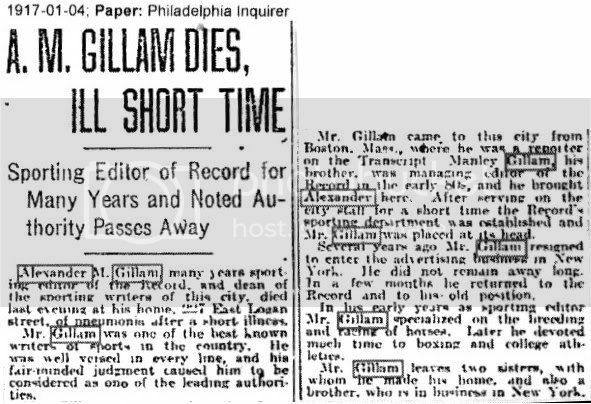 Philadelphia Inquirer obituary, January 4, 1917. ---------------------------------------------------------------------------------------------------Appeared in 1889 book------------------------------------------Chicago Daily Tribune obituary, January 4, 1917, pp. 9. Last edited by Bill Burgess; 03-23-2014, 04:37 PM. Sporting Life obituary, March 12, 1898, pp. 11. --------------------Appeared in 1889 book----------------------------------Boston Daily Globe obituary, March 4, 1898, pp. 5. Last edited by Bill Burgess; 03-23-2014, 04:04 PM. Died: September 16, 1914, New York, NY, age 53,---d. bowel trouble, underwent an operation at Mt. Sinai Hospital (NYC). 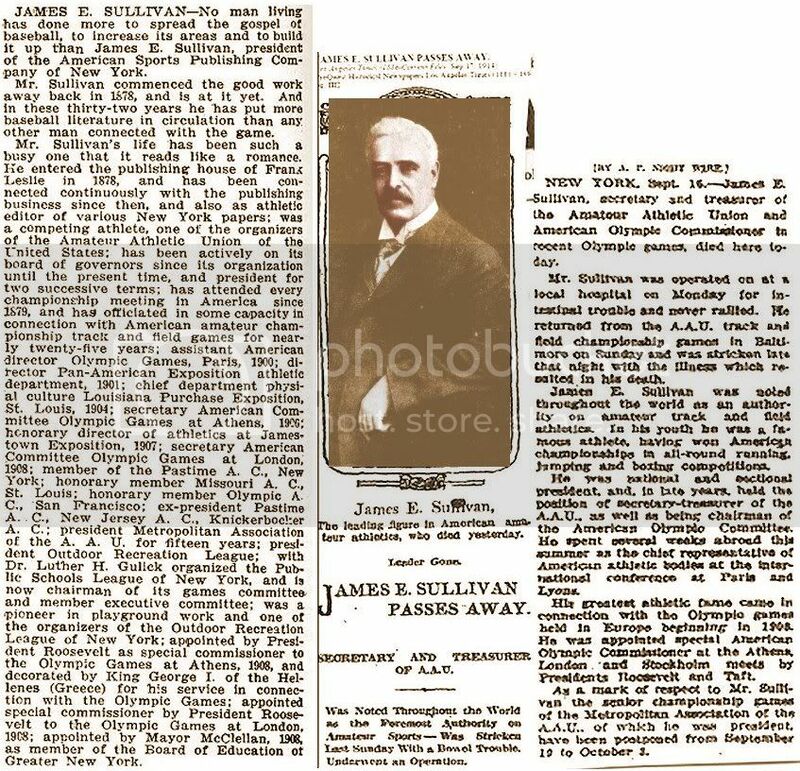 James Edward Sullivan (November 18, 1860 in New York City – September 16, 1914) was an American sports official. 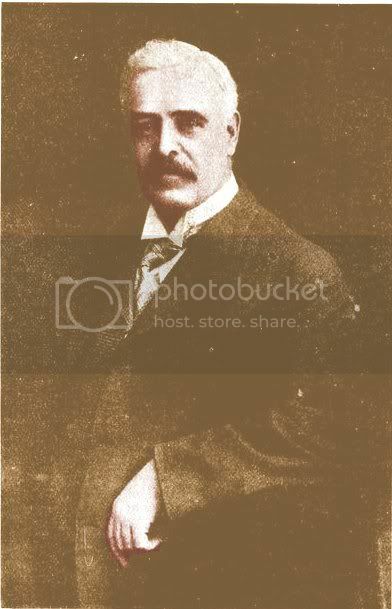 He was one of the founders of the Amateur Athletic Union (AAU) in 1888, serving as its secretary from 1889 until 1906 when he was elected as president from 1906 to 1909. He declined a fourth term and was re-elected to his former position as secretary-treasurer until his sudden death which followed an emergency operation. His business career began in 1878 in a publishers. In 1880 he started a paper, The Athletics News. His career continued in sports publishing, and sporting goods businesses. His athletics on the track had started in 1877 as a member of the Pastime Athletic Club. In 1888 and 1889 he won the all round championship of the club. He also was one of the most influential people in the early Olympic movement, although his relationship with IOC president Pierre de Coubertin was tense. Sullivan was also an organizer of the Outdoor Recreation League and served as its second president. 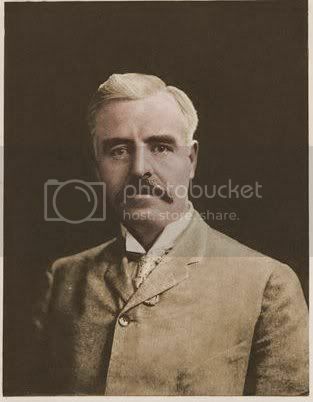 During the 1908 London Olympic Games, Sullivan as Secretary of the American Olympic Committee, lodged a stream of protests averaging almost one per day over two weeks. It seems that Sullivan may have been trying to consolidate his position in the sporting hierarchy at home, and he felt that he must be seen to be fighting for the rights of the American team. His complaints went down well in the sensationalist press but in the more respected and responsible journals there was a quite different view of Sullivan’s behaviour. On his return to the U.S. Sullivan said, "The victory of the American team at the Olympic Games was undoubtedly the greatest in the history of Amateur sport in the world, when it is taken into consideration the handicaps the members were subjected to. I do not wish to criticise British sportsmen generally, for there are many fair minded people among them but I want to make it as strong as possible that the attitude of Messrs: Davidson, Andrews, Fischer, and Dr Bulger, the English Officials of the games, was not only outrageous to Americans, but contrary to their own rules, and if these men continue to dictate affairs, England will become athletically degenerate." Sullivan also served as the chairman of the Greater New York Irish Athletic Association in 1903 and on the New York City Board of Education from 1908-1912. 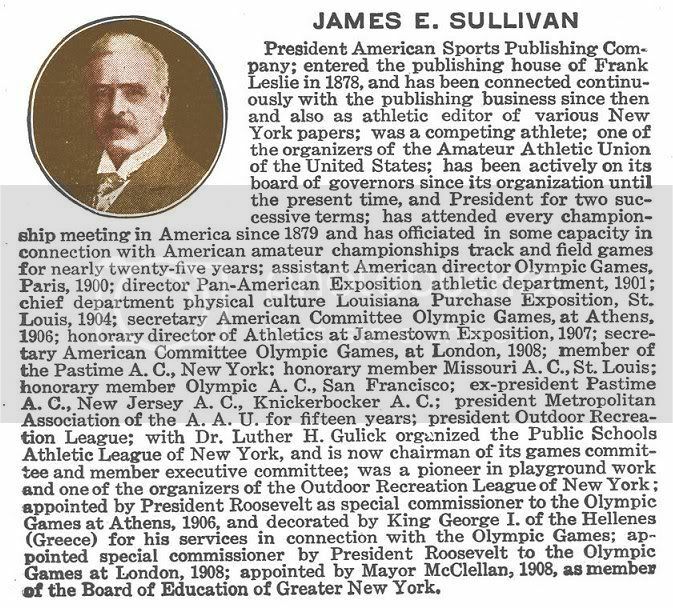 In 1930, the AAU established the James E. Sullivan Award in his honour. It is awarded annually to the best amateur athlete in the US. In 1977, he was inducted into the National Track & Field Hall of Fame. Sporting Life obituary, September 26, 1914, pp. 5. --------------------------------------------------Los Angeles Times' obituary, September 17, 1914, pp. 112. Last edited by Bill Burgess; 03-23-2014, 03:35 PM. Died: February 23, 1934, Chicago, IL, age 70,---d. of a heart attack, which followed indigestion, while at his hotel, on a 3-day holiday at Hot Springs, Arkansas. Was a member of the St. Cecelia Masonic Lodge. He loved horse racing and enjoyed making small wagers. ------------------Appeared in 1889 book--------------------------------------------------------Chicago Daily Tribune obituary, February 23, 1934, pp. 27. Last edited by Bill Burgess; 03-23-2014, 03:04 PM. Died: October 2, 1900, Hot Springs, Arkansas, age 34,---d.---in his room at the Pullman Hotel, of cirrhosis of the liver. Arrived in Hot Springs in May 1, 1900 for dropsy. Buried: Catholic Greenwood Cemetery, Hot Springs, Arkansas. Had worked on papers in St. Louis and Kansas City. Chicago Daily Tribune obituary, October 7, 1900, pp. 19.--------------------Sporting Life obituary, October 20, 1900, pp. 3. 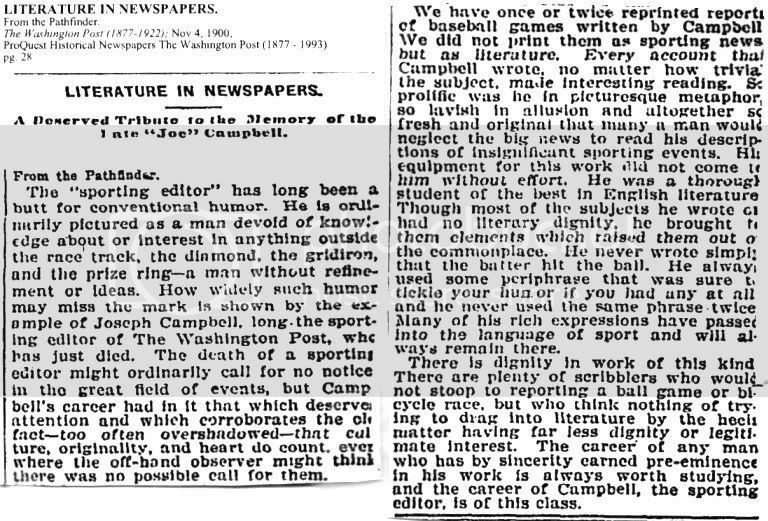 Washington Post obituary, October 3, 1900, pp. 8.----------------------------------------------------------Washington Post obituary, November 4, 1900, pp. 28. Are you sure Campbell only joined the Post in 1897, Bill? I have no specific reason to doubt that, it's just that I've read a good deal of the Post's coverage in the 1890's, and I thought Campbell had started there sooner. He was a good writer, with a very distinctive colloquial style, at least I thought he was, but it may I've misidentified another writer's style as Campbell's. One thing is certain, Campbell was in the habit of inventing quotations and foisting them on people who never said them. I've seen quotes that were obviously fabricated, in part because they were uttered in Campbell's peculiar style, in part because the individuals were supposedly uttering opinions about things they are not likely to have known anything about. 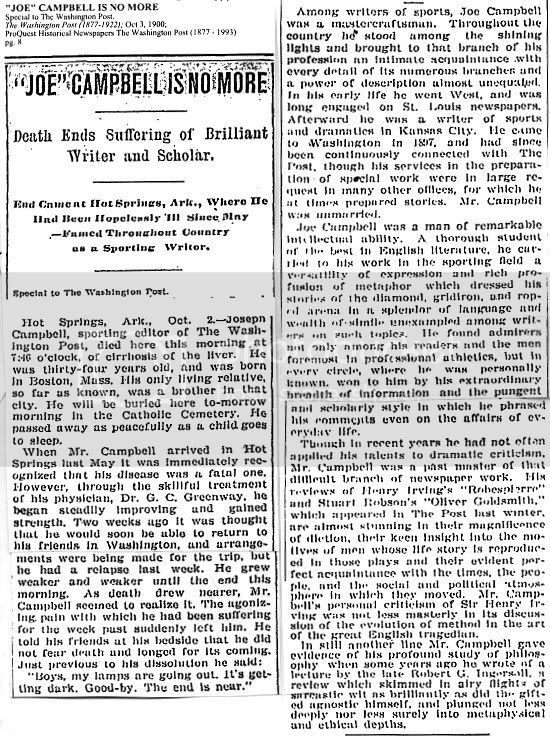 After Campbell's death, a Cincinnati sportswriter said that he used to tell other writers it was a waste of effort to take the trouble to look a man up in order to interview him, because you could always write whatever you wanted and then have them say it. Interesting stuff as always, Bill. I notice the Post itself (but in a story sent from Hot Springs) says he came to Washington in 1897, while John Heydler in Sporting Life says 1895, which is closer to what my impression was. But since these stories hardly ever had bylines, and then they were sometimes pseudonyms, it's difficult to tell. Here again is the Post quoting Pulliam in 1899, after Louisville had turned down Hanlon's offer to trade a sore-armed Hugh Jennings for Honus Wagner: "Hanlon offered to do business with us if we would separate from Honus Wagner. But Hanlon cut a face full of eye teeth for me when I gave up coin for George [Hemming] three years ago. Hanlon is looking out for Hanlon and number one, and I will sidestep any effort of his to wheedle [sic] me into making a deal. He has a Svengali gift of making people believe that he is always laying awake overtime thinking up schemes to do Hanlon. He talked as if it would be a special favor for me if I gave him Honus Wagner for Hughey Jennings." 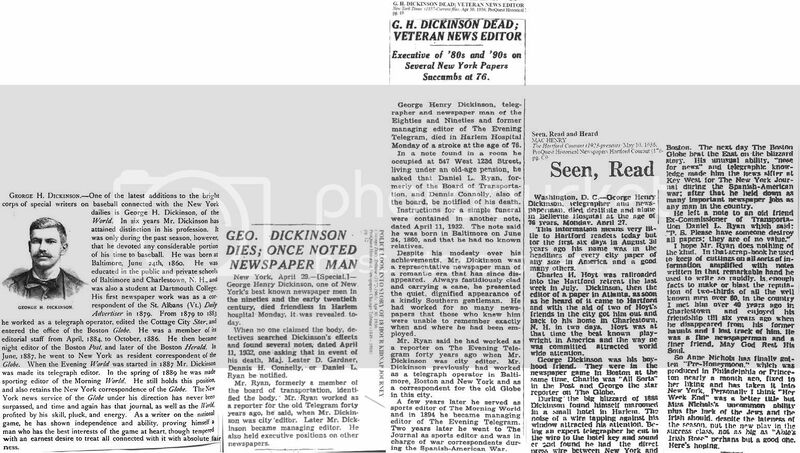 Notice the use of "Svengali", which also appears as a Campbellism in the Chicago Tribune's obit. It's more than possible that Harry Pulliam did express these sentiments concerning Hanlon, but the manner of expression in all three seems too consistent for the style to be anything but pure Campbell. Last edited by Bill Burgess; 03-23-2014, 02:02 PM. Died: September 18, 1934, New York, NY, age 76,---d. at home of acute indigestion. Philadelphia Press, baseball editor, spring, 1886 - ? Father: William, born Ohio, 1838? ; Mother: Mary (Mimie), born Frankfurt-on-the-Main, Prussia (Germany), February 21, 1841; Wife: Anna A., born Ohio, March, 1859; Daughter: Mamie E., born Ohio, September, 1880; Son: Willmer H., born Ohio, February, 1883. ---------------------------------------------------------------------------Appeared in 1889 book------------------New York Times' obituary, September 19, 1934, pp. 20. Last edited by Bill Burgess; 03-23-2014, 01:35 PM. Died: April 20, 1904, Brighton Beach, NY, age 40?,---d. on the elevated subway L train headed to Brighton Beach in Brooklyn. He toppled over in his seat at Grand Ave. station. Promoted boxing matches and 6-day bicycle races. Sporting Life obituary, April 30, 1904, pp. 12. 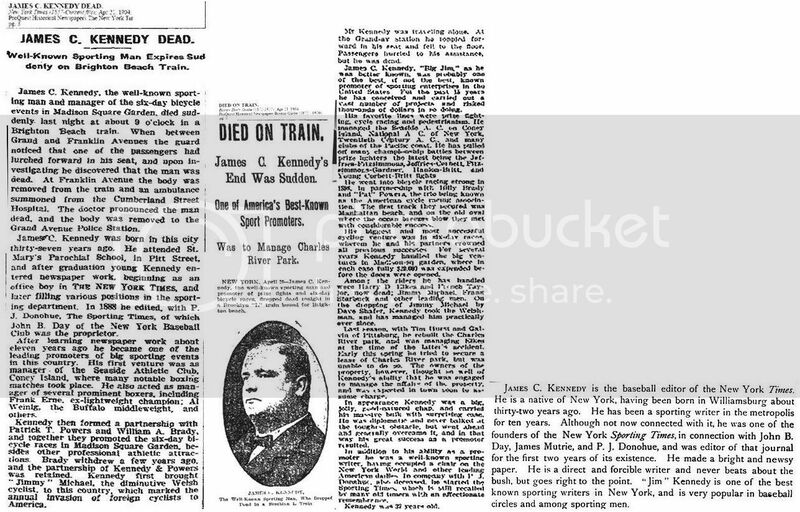 New York Times' obituary, April 21, 1904, pp. 3.--------Boston Daily Globe, April 21, 1904, pp. 3. Last edited by Bill Burgess; 03-23-2014, 01:24 PM. Died: April 27, 1936, NYC, age 78,---d. in Harlem Hospital (NYC). Attended public schools in Baltimore and Charlestown, NH. 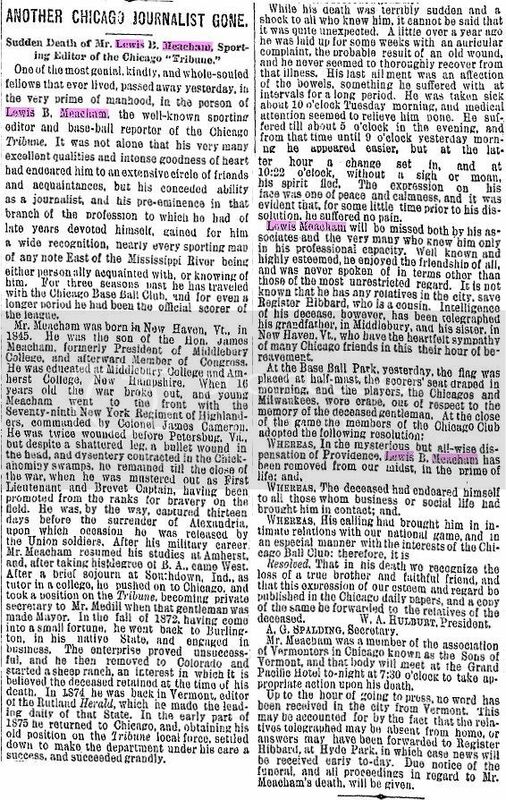 ---------------------------------------------------------------------Chicago Daily Tribune obituary,------------New York Times' obituary-------------Hartford Courant, May 10, 1936, pp. C9. ----------------Appeared in 1889 book---------------------------------April 30, 1936, pp. 12. --------------------April 30, 1936, pp. 19. Last edited by Bill Burgess; 03-23-2014, 01:00 PM. Sporting Life health update, July 8, 1911, pp. 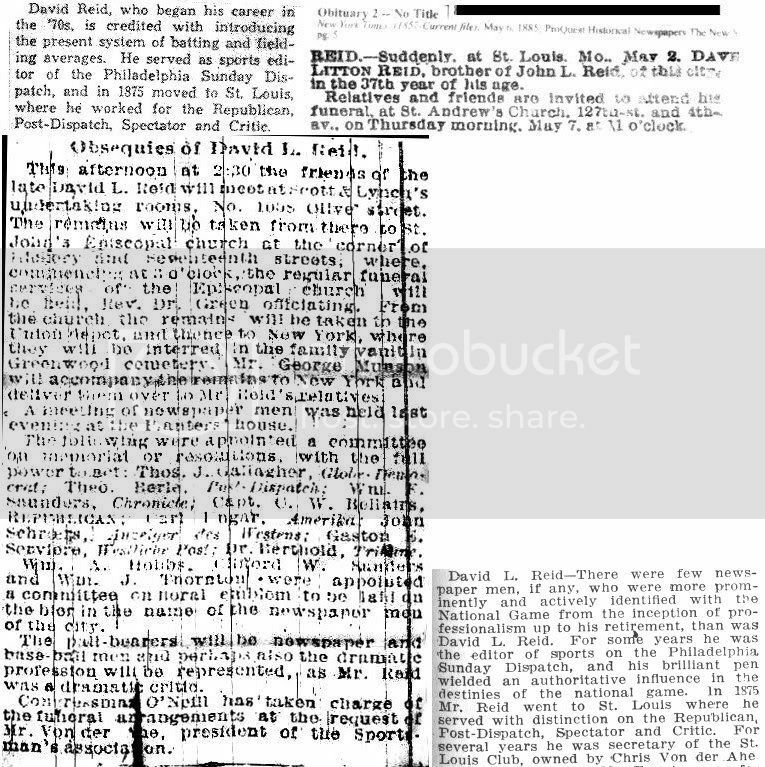 4.---Sporting Life obituary, January 6, 1912, pp. 3. ------------------------------------------------------------------Sporting Life obituary, January 13, 1912, pp. 15. Last edited by Bill Burgess; 03-23-2014, 12:10 PM. Philadelphia Inquirer, 1929 - 1958, sports writer, 1946 - 1958, sports editor, 1958 - 1976. Class of 1993: Philadelphia Section PGA Hall of Fame. Fred Byrod was born in Sunbury, Pennsylvania in 1911 where his father and uncle owned the local newspaper. By the time he was in high school he was writing articles on sports for the newspaper, which brought him to Temple University and the study of journalism. He graduated from Temple in 1933 but he had already been working for The Philadelphia Inquirer newspaper since 1929. When the United States became involved in World War II Byrod interrupted his career to enlist in the Army and was commissioned in 1942. He served for three years in the South Pacific as an infantry officer on Iwo Jima and New Caldonia. When the war ended he returned to the Inquirer. He was promoted to sports editor in 1958 and held that position until his retirement in 1976. In the 1940s he became involved in promoting Philadelphia golf when the Inquirer sponsored the PGA Tour’s Inquirer Invitation Golf Tournament, which was held at the Torresdale-Frankford CC, Llanerch CC, Cedarbrook CC and the Whitemarsh Valley CC, for a total of five years. Byrod began his promotion of the tournament each year by attending the Masters Tournament in April. The tournament was managed by The Philadelphia Inquirer Charities, Inc. and the Philadelphia Section PGA. When Byrod was at the Masters interviewing the leading players the Inquirer tournament would get mentioned. Right after the Masters he would begin writing articles in the newspaper to inform the local golf fans about the big name golfers that were coming to Philadelphia for the tournament. The year that the tournament was at Cedarbrook, Byrod used his persuasive powers and a bottle of red wine to sign up Bobby Locke for the tournament, which he went on to win. Byrod covered 29 Masters Tournaments, 28 U.S. Opens and twelve PGA Championships for the Inquirer. Over the years he became known and respected by the players. In Byrod’s later years at the Masters he would be summoned to Bobby Jones’s cabin for a private interview. 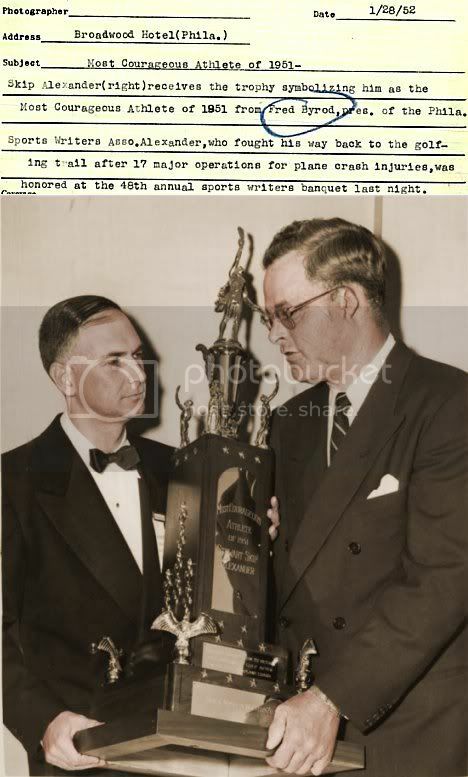 When Ben Hogan won the U.S. Open at Merion GC in 1950 it was just 16-months after his near-fatal automobile accident. Having played 90 holes in four days Hogan informed the press that he was too exhausted for interviews. After some prodding he relented and said that he would speak only to Fred Byrod. Byrod had experience doing private interviews with big name golfers. In 1939 the U.S. Open was being held at the Philadelphia Country Club and Byron Nelson was the professional at the Reading CC. The Inquirer had Byrod hire Nelson to do a story on the U.S. Open each day of the tournament. After each round Byrod would interview Nelson for the article, which Byrod would write. The Inquirer would print it under Nelson’s name, with no mention of Byrod. During World War II he served three years in the South Pacific rising to rank of captain in the army. After retiring from the Inquirer in 1976 the newspaper still featured a golf column by him each week. He didn’t play golf until after he had begun writing about it. Byrod said that from the beginning Ed Dudley and Marty Lyons took an interest in him, explaining tournament golf and introducing him to the better players. With the help of George Fazio and Bud Lewis he learned to play well enough to break 80 on occasion and he won the Philadelphia Newspapermen’s golf championship twice. Byrod was president of the Philadelphia Sportswriters and the Golf Writers Association of America. He became a walking encyclopedia on golf in Philadelphia. He was known for never missing a thing in his interviews and the accuracy of his articles. When a new magazine called Philadelphia Golf Magazine started up in 1986 he was Executive Editor, which featured more than one article by him each month. He was a tireless promoter of golf in Philadelphia and the Philadelphia PGA. Byrod was inducted into the Philadelphia Section PGA Hall of Fame in 1993. 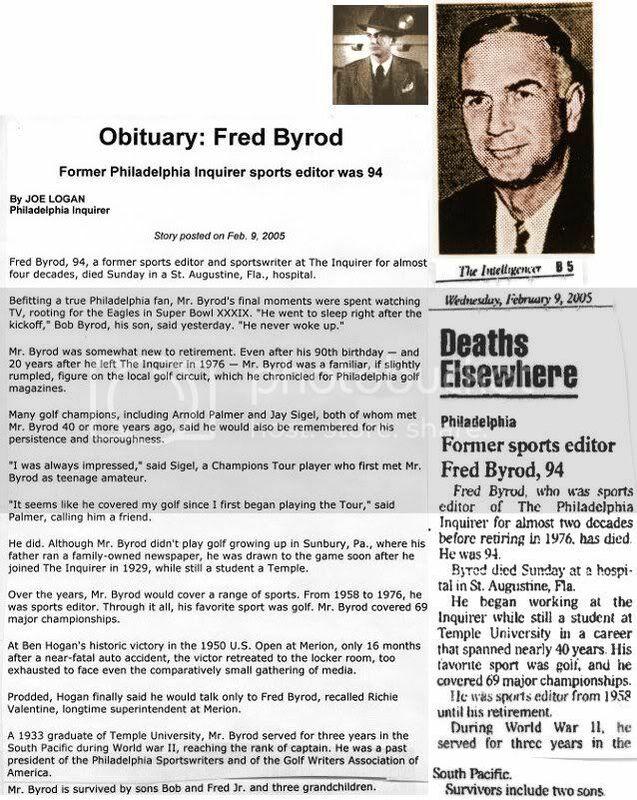 Philadelphia Inquirer obituary, February 9, 2005.----------------------------------------January 28, 1952: Broadwood Hotel, Philadelphia, PA: Fred Byrod / Skip Alexander. Last edited by Bill Burgess; 03-23-2014, 11:39 AM. Died: June 27, 1873, New York City, NY, age 31,---d. at home (15th St. in NYC) of congestion of the kidneys, complicated by pneumonia. Studied to be a priest at St. Charles College, a Catholic college, starting January 22, 1861. St. Charles College is the minor seminary, while St. Sulpice is the major seminary of St. Mary's in Baltimore, MD. Didn't graduate. Attended Seton Hall, NJ, September 23, 1861 - February, 1862, didn't graduate. Was listed as a New York Herald reporter by Seton Hall. New York Herald; Baseball reporter for 10 years, dramatic critic, city editor. Started working for them by at least, September 23, 1861. In 1872, accepted the office of Clerk of the Board of Assistant Aldermen for a short time. Michael was a Roman Catholic. Michael J. Kelly‚ baseball reporter for the New York Herald and editor of the DeWitt baseball guide in 1868‚ is largely credited with developing the official baseball scorecard in 1861 and boxscore. After he died, a benefit game between the Atlantics/Mutuals was played on July 19, 1873, at the Union Grounds, for the benefit of his family. The game netted $1,000. for his widow and 2 children. The Atlantics won 9-6. A large crowd attended, and might have been twice the size if not for the possibility of rain. Sporting News, January 30, 1952, pp. 16, column 2.----New York Times, July 1, 1873, pp. 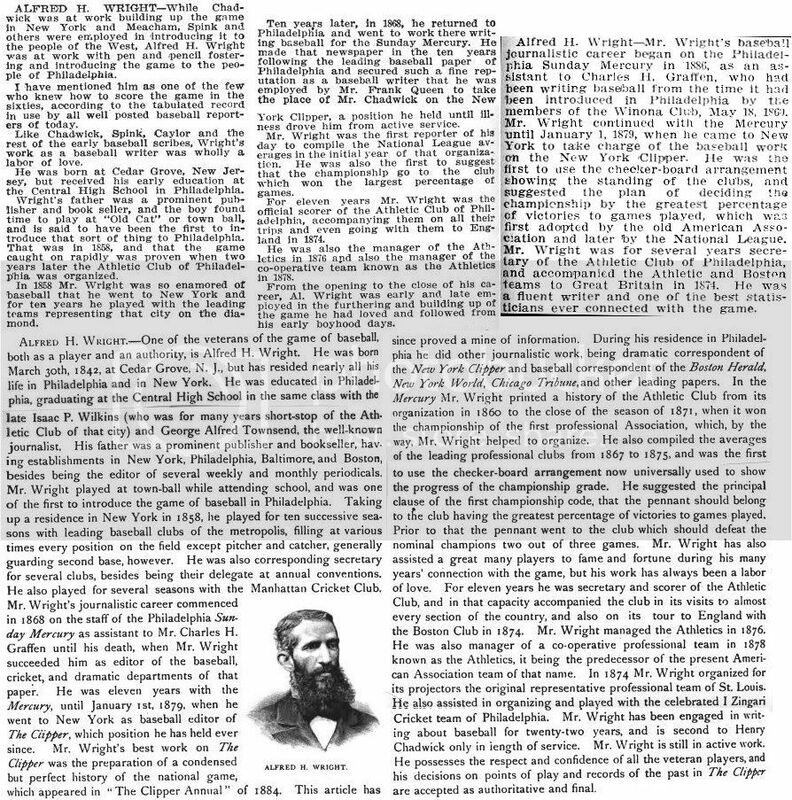 8.-----------------New York Herald Obituary, June 29, 1873, pp. 7. New York Times' Obituary, June 28, 1873, pp. 7. Last edited by Bill Burgess; 02-24-2014, 04:01 PM. Died: October 2, 1878, Chicago, IL, age 32,---d. on a Wednesday of heart disease, biliary colic. Buried: West Cemetery, Middlebury (Addison County), Vt. Son of Honorable James Meacham, 6 term Congressman from Vermont, 1849-1856. Private in the Volunteer Vermont Regiment and 1st Lieutenant of the New York Highlanders, 1862-65. Served in Civil War, 1862-65. Captured, served time in Southern prisoner-of-war camp. Moved to Chicago in 1866 at age of 20. Chicago Tribune reporter in 1860's. Helped popularized baseball in Chicago. Used box scores. Along with William Hulbert, he formulated the plan to organize the National League. Was present at famous fire in 1871 on roof. One of 1st to use box scores. reporter and associated editor at the Chicago Tribune, 1875-78. 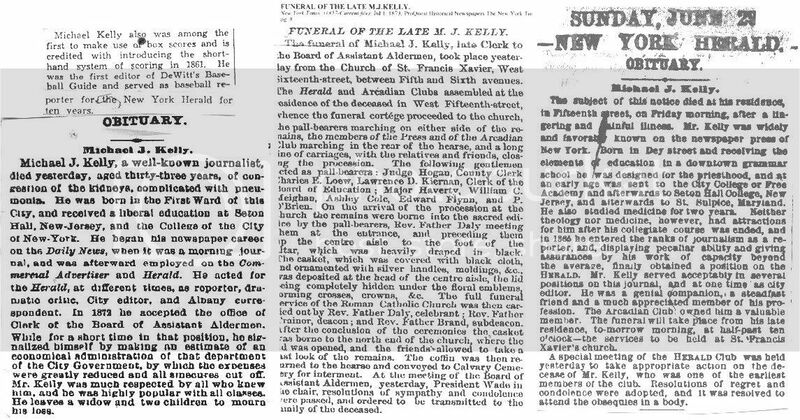 From the summer of 1875 to his death, he was the Chicago Tribune's baseball reporter, gaining national recognition for the excellence of his work. Was the Chicago baseball correspondent for the Boston Herald. James Meacham, a Representative from Vermont; born in Rutland, Rutland County, Vt., August 16, 1810; was graduated from Middlebury (Vt.) College in 1832; taught in the seminary at Castleton, Vt., and in the local academy at St. Albans, Vt.; attended Andover (Vt.) Theological Seminary, where he studied for the ministry and was ordained as a Congregational minister in 1838, assuming his duties as pastor in New Haven, Vt., and served from 1839 to 1846; tutor and professor at Middlebury College 1846-1850; elected as a Whig to the Thirty-first Congress to fill the vacancy caused by the resignation of George P. Marsh; reelected as a Whig to the Thirty-second and Thirty-third Congresses, and elected as an Opposition Party candidate to the Thirty-fourth Congress and served from December 3, 1849, until his death in Rutland, Vt., August 23, 1856 in Middlebury, Addison, VT; chairman, Committee on District of Columbia (Thirty-fourth Congress); interment in West Cemetery, Middlebury, Vt.
His first wife was Caroline Bottum. She was born 1820, and died 02 Jun 1843 in New Haven, Addison, VT. James married Carolin May 17, 1842 in Middlebury, Addison, VT. 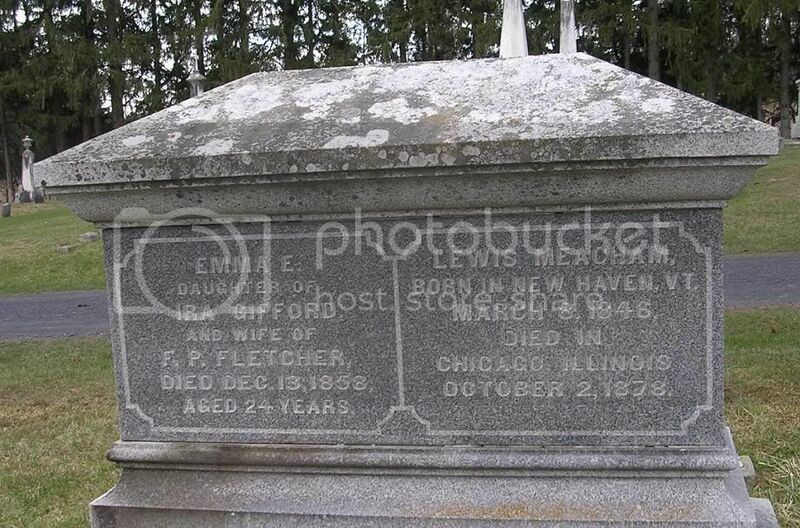 Mother: Mary Frances Gifford Meacham, born December 16, 1821, New Haven, Addison, VT, died December 30, 1884, Middlebury, Addison, VT. She married James Meacham on February 20, 1845 in New Haven, Addison, VT. Her parents were Ira Gifford and Lucia Fuller. In memoriam: Lewis Meacham born at New Haven, VT about 1846 died at Chicago Oct 2, 1878. He was a founder of the Sons of Vermont, calling upon the natives of VT residing in Chicago, to assemble at the Sherman House in January 1877 to consider the formation of a society of native Vermonters residing in the West. He was the son of James Meacham of New Haven and Middlebury, VT, a Congregational minister, Professor at Middlebury College and the Representative in Congress from that district from 1849 to 1856. He went to school at Amherst, Mass and at Middlebury, VT. At the outbreak of the war he enlisted as a private in a VT regiment. A year later he re enlisted in the New York Highlanders, rising to rank of 1st Lt. After being mustered out, he acted as tutor in Christian College, Sullivan County, Indiana. He came to Chicago and was proofreader for the "Chicago Times" and then for the "Tribune". In Dec 1871 he was appointed private secretary by the Mayor of Chicago. In 1872 he went to Burlington, VT and with his uncle, Mr. Gifford, started a brush factory. That proved unsuccessful and in 1873 he went to Colorado to go into the sheep raising business. In 1874 he went back to Vermont and became local editor of the "Rutland Herald". He returned to Chicago in the Spring of 1875 and worked again on the "Tribune". Brooklyn Eagle, October 9, 1878, pp. 3.--------------------Sporting News, January 30, 1952, pp. 16, column 3. Chicago Daily Tribune, October 4, 1878, pp. 3. 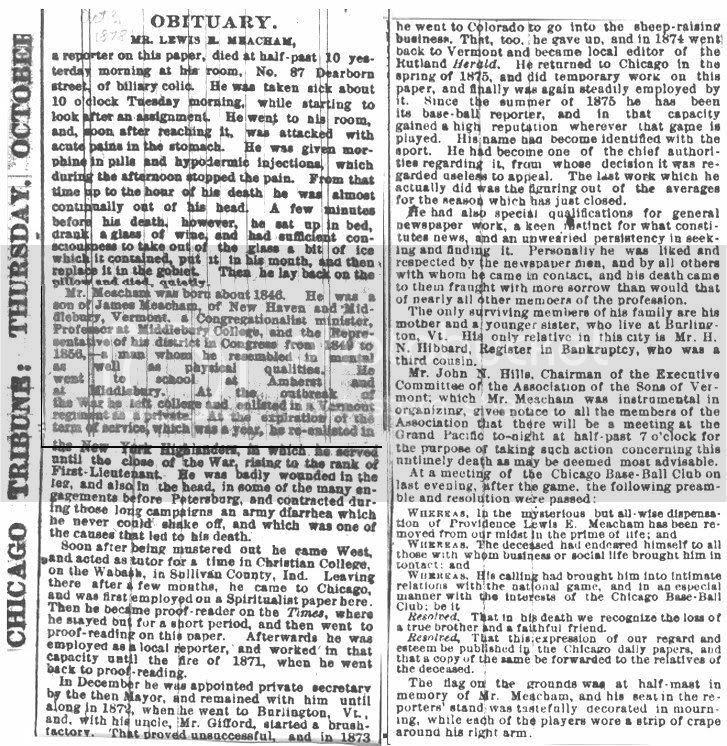 Chicago Inter Ocean obituary, Thursday, October 03, 1878, pp. 8.------------Chicago Inter Ocean obituary, Saturday, October 05, 1878, pp. 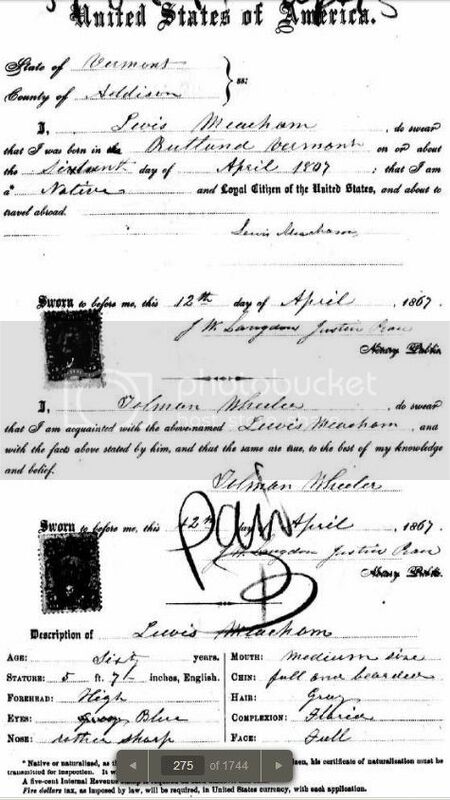 8.---Passport application for April 16, 1867. 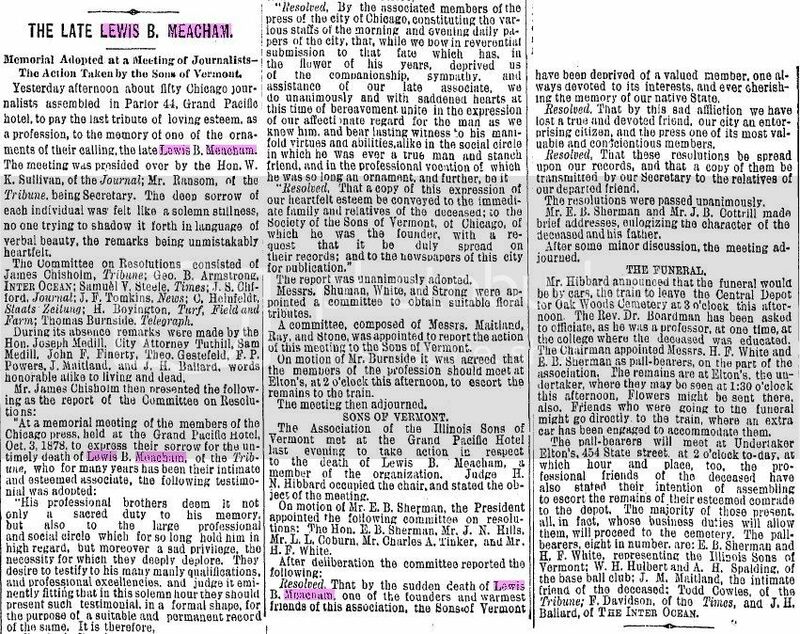 Chicago Inter Ocean obituary, Friday, October 04, 1878, pp. 8. Last edited by Bill Burgess; 03-23-2014, 11:22 AM. *His Date of Birth/middle name were confirmed by Christ Church, Episcopal Church in Nashville, TN, and correspond with his census/obituary information. Raised/educated in NYC; Began in dry goods business. 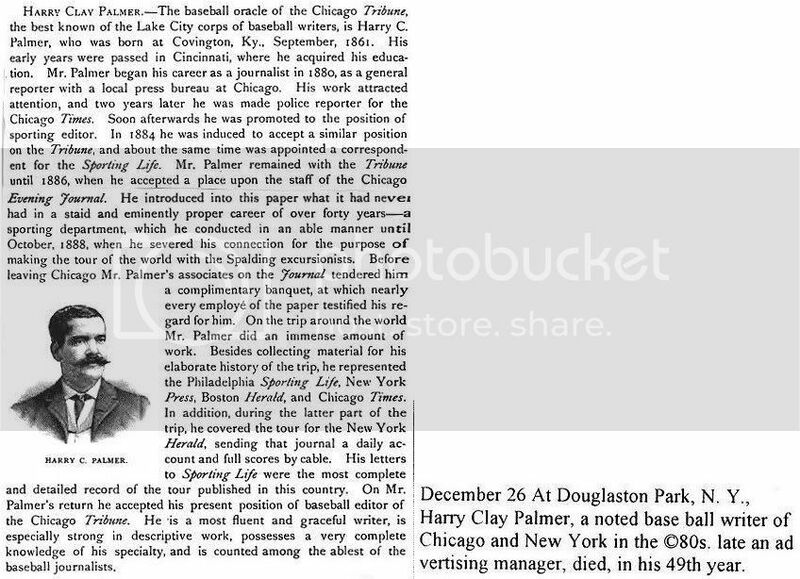 Wrote baseball for New York Clipper, New York Herald, New York Times, Sunday Mercury. 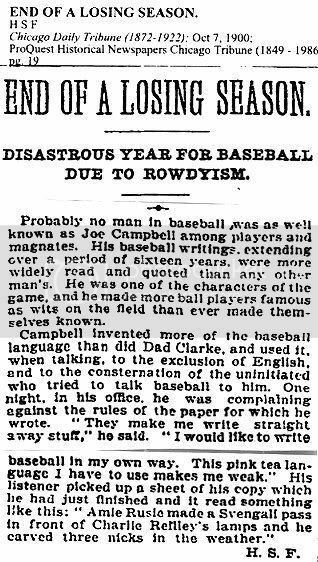 Began writing baseball around 1868. Moved to Philadelphia by at least 1873, maybe slightly earlier. Served as sports editor of the Philadelphia Sunday Dispatch, helping them establish their national baseball reputation. Served as secretary of Philadelphia Athletics, 1872 - March 3, 1873?. Moved St. Louis in 1875. Secretary of St. Louis Browns from February, 1885 until his death May 2, 1885. Credited with developing present system of batting / fielding ave.
St. Louis Herald, (started their sporting department, January 6, 1878. St. Louis Post-Dispatch, October 30, 1883 - ? Was original scorer for St. Louis Browns. Brother: John L.
David's family, according to the 1850 census. Dave Reid Dead; Sudden demise of a Well-Known Sporting Editor. David Lytton Reid, one of the best known sporting writers and base ball enthusiasts, died at the residence of his friend and chum, George Munson, 1321 Pine street, very unexpectedly last evening at 9:40. His death was very unexpected after a very brief illness. Late Friday afternoon, while at Grand and Easton avenue, he was suddenly taken with a congestion chill, resulting in severe cramping of the stomach and the pain became violent after he arrived at Mr. Munson's room on Pine street. He laid down on the lounge for a while and his wants were administered to by Mrs. Brothers, who at his suggestion called in Dr. Rutledge and after a short while relief was afforded and he passed an easy night, relieving to a great extent the anxiety and fears which the symptoms first aroused. In the morning he woke up early about 6 o'clock, and seemed greatly refreshed over his night's rest. He spoke cheerfully of his condition, and in response to inquiries stated that he was very greatly relieved. During the day, however, he became worse, and toward evening the hand of death became visible over his cold body. Surrounded by a large number of friends, he quietly passed away at 9:10 P. M., being conscious to the last. His death will be a severe blow to his legion of friends throughout the country, his many excellent qualities of heart and mind endearing him to all with whom he came in contact. He was best known by his remarkable knowledge of national game affairs, his writings on base ball having been recognized everywhere as authoritative and thoroughly reliable. Dave Reid was a name familiar to all baseball men, managers, players, and all those associated with the national game, and his untimely death will be all the more mourned, because of the loss of one whose versatile talents and fine abilities as a writer and grand characteristics as a man made him a prominent figure in the everyday walks of life. He was born in Nashville, Tenn., nearly thirty-seven years ago. His parents soon removed to New York city, where he was reared and received his education. He began life in the dry goods business, but his remarkable natural bent for newspaper work soon found cultivation in the large range of the metropolitan press. He wrote largely for the New York Clipper, Herald, Sunday Dispatch, New York Times, Sunday Mercury and other noted New York papers. Early in the seventies he moved to Philadelphia and became one of the managing editors of the Philadelphia Sunday Dispatch, devoting the greater portion of his time and talents to the base ball department, which was recognized as the leading authority on the national game, and established for the paper a grand reputation. This afternoon at 2:30 the friends of the late David L. Reid will meet at Scott & Lynch's undertaking rooms, No. 1008 Olive street. The remains will be taken from there to St. John's Episcopal church at the corner of ? and Seventeenth streets, where, commencing at 3 o'clock, the regular funeral services of the Episcopal church will be held, Rev. Dr. Green officiating. From the church the remains will be taken to the Union depot, and thence to New York, where they will be interred in the family vault in Greenwood cemetery. Mr. George Munson will accompany the remains to New York and deliver them over to Mr. Reid's relatives. A meeting of newspaper men was held last evening at the Banters' house. The following were appointed a committee on memorial or resolutions, with the full power to act: Thos. J. Gallagher, Globe-Democrat; Theo. Rerla, Post-Dispatch; Wm. 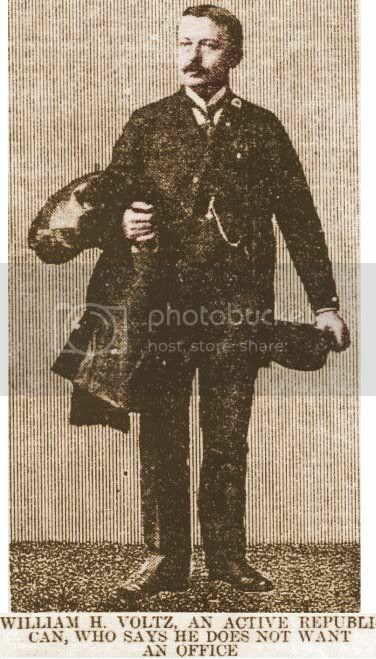 F. Saunders, Chronicle; Capt. O. W. Bellairs, REPUBLICAN; Carl Bangar, Amerika; John Schroars, Anzeiger des Westens; Gaston E. Serviere, Westhebe Post; Dr. Berdhold, Tribune. Wm. A Hobbs, Clifford W. Sanders and Wm. J. Thornton were appointed a committee on floral emblem to be laid on the bier in the name of the newspaper men of the city. The pall-bearers will be newspaper and base-ball men and perhaps also the dramatic profession will be represented, as Mr. Reid was a dramatic critic. Congressman O'Neil has taken charge of the funeral arrangements at the request of Mr. Von der Ahe, president of the Sportsman's association. Sporting News, January 30, 1952, pp. 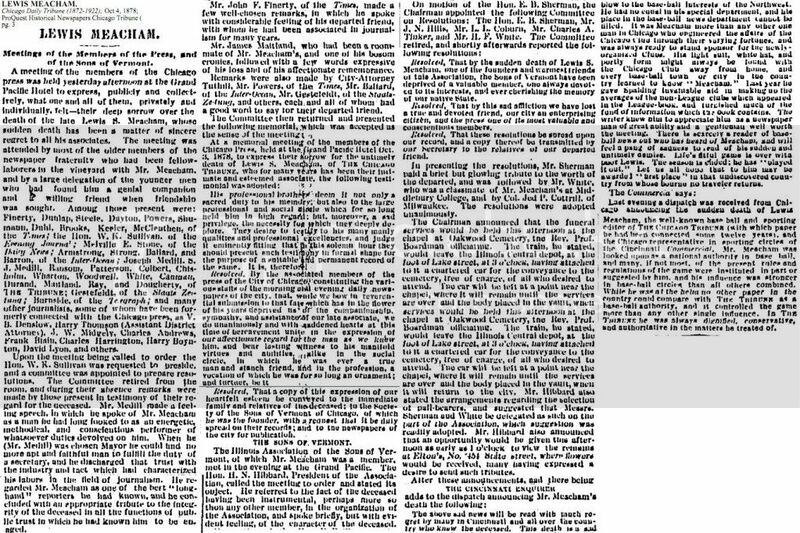 16, column 1.-------New York Times' death notice, May 6, 1885, pp. 5. The St. Louis Republican, May 4, 1885, pp. 5. Sunday, May 03, 1885, pp. 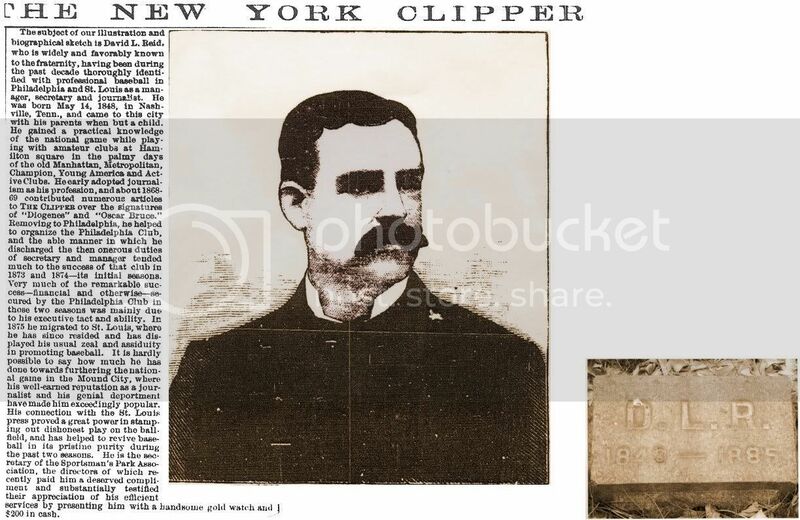 8.--------------The New York Clipper, December 2, 1882. Last edited by Bill Burgess; 03-23-2014, 10:56 AM. 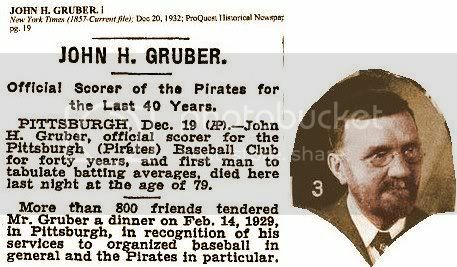 Pittsburgh Pirates' official scorer, 1893 - 1932. Began sports department in early newspapers. New York Times' obituary, December 20, 1932, pp. 19. Last edited by Bill Burgess; 03-22-2014, 02:47 PM. Died: April 20, 1905, New York, NY, age 63,---d. at home of locomotor ataxia. Phladelphia, PA, 1868 - ?, and began writing for the Sunday Mercury. Philadelphia Sunday Mercury reporter, 1868 - January 1, 1879. Succeeded Henry Chadwick as New York Clipper writer, January 1, 1879 - March, 1894. Was 1st to compile NL ave. & 1st Philadelphia A's scorer. 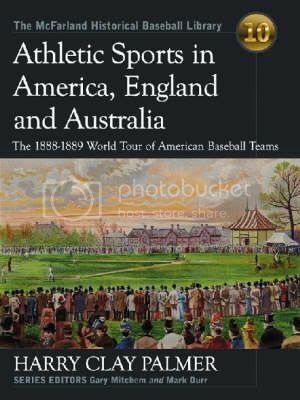 Toured England in 1874 with Philadelphia Athletics. Managed the Philadelphia team in 1876. It was he who first suggested awarding the championship by the greatest percentage of victories/games played, which was first adopted by the American Association, and later by the National League. Mr. Wright suffered from locomotor ataxia for over 30 years. Sporting Life obituary, May 6, 1905, pp. 9. Sporting News, January 30, 1952, pp. 16, column 1. Last edited by Bill Burgess; 03-22-2014, 01:49 PM.